I have always loved the pictures of English Country gardens, complete with the occasional cute little bunny, nibbling contentedly on some random grass or weed. A lovely vision, but unfortunately nothing like where I live. With drought even worse than usual this year the rabbits have become voracious predators, eating everything that they can get their self-sharpening teeth on. I have considered building enclosures for my beds for several years. I loved the pictures of neatly constructed cedar or redwood frames, with hinges for easy access and latches to keep the covers from blowing open. But have you priced quality wood lately? I have, and it just wasn’t going to happen. So I took my old standby PVC pipe, and went to work. My larger enclosures use 10 foot sticks of 1 inch PVC and my smaller ones use 3/4 inch PVC. I do not recommend using anything smaller than 3/4 inch PVC – it just won’t have the structural stability that you need. 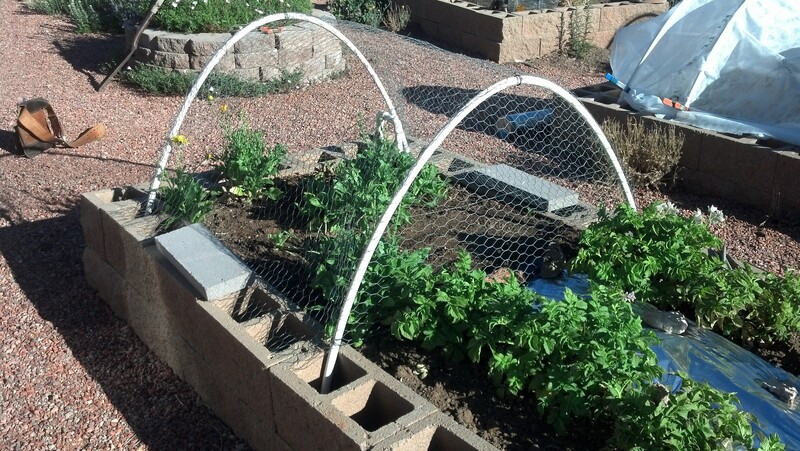 In previous years I have used these PVC pipe arches to support row covers over my garden beds. The row covers allowed me to set my vegetable seedlings out before all danger of frost was gone, protected them from bugs, protected them from hail storms, and allowed me to extend the summer season solidly into the edge of winter. So first let’s take a look at my garden beds. Because the quality of the soil where I live is very poor, and water is something that rarely arrives from the sky, I used raised beds that are made of dry laid cement blocks. Adding the PVC arches is very simple. I just buy 10 foot sticks of PVC pipe, bend it and stick the ends in the concrete blocks that make up my raised beds. This picture shows some of the beds in my garden. The closest bed has a small chicken wire cage on one end and the bed to the right has a row cover on the PVC hoops. If you do not have raised beds, or you have raised beds that are made from boards, railroad ties, or dry laid stone, you will need to put something into the ground to hold the ends of the PVC pipe. The most efficient, sturdy, and available “something” is a piece of rebar. Large home stores sell rebar precut to different lengths. They are not cheap, but they will last a lifetime and more. I would not buy anything shorter than a foot. You want to have several inches to drive into the ground and about six above ground. If your ground is particularly friable (not structurally stable) you may need to buy 18 inch pieces in order to have sturdy supports for your “cage”. The stakes and/or PVC pipes are placed so that they line up with the middle or the edge of a piece of wire. 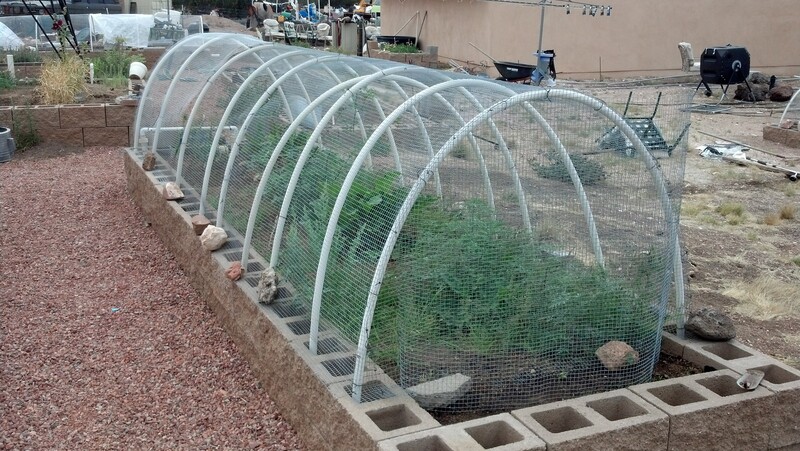 For instance, if I was using five foot tall chicken wire, which does not have much structural stability, I would plan to use a PVC hoop at each end and one in the middle to support the wire and keep it from crushing easily. On the other hand, if I was using two foot tall 1/2 inch hardware cloth I would place one hoop on each edge of the hardware cloth, and that would be more than enough support. But how do I keep my wire on the hoops? Simple – cut pieces of baling wire that are long enough to wrap around the PVC pipe, stick through the wire, and wrap into a twist to hold everything together. I usually just cut my wire, form a U shape, push the wire U through the wire fencing and twist the ends together the same way that that you would twist a twist tie. I often use a pair of pliers to do the actual twisting – saves the fingers a bit and makes for a tighter twist. And this is what you wind up when you are done – a complete cage over and around the vegetable bed. This particular bed also has a “c shaped” piece of hardware cloth attached to the end to protect the pole beans from rabbits and crows (they sometimes pull newly sprouted beans). I did not put the pole beans inside the cage because I want to allow the beans to climb on the top of the cage. But, you say, how do I get to my veggies to harvest them and pull weeds? We will discuss creating access next time.